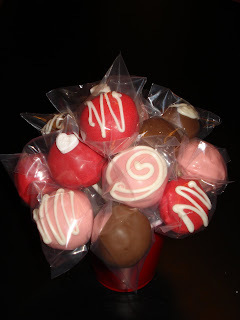 After getting the idea of cake pops from bakerella.com, I decided to try and create some on my own. My first attempt was for valentines day. 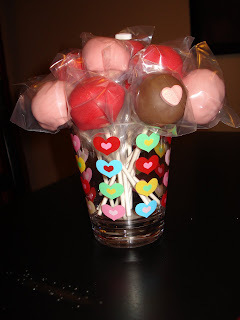 I made four dozen cake pops and gave them away as valentines! I made half white cake and half chocolate fudge cake. I had lots of fun making and creating them. It has became very addictive and really enjoyable!!!!! Hope you like my creations!